I don't think I'll ever get bored of showing off! This picture was from the Windam World Cup this past summer. I had a great weekend watching the worlds best racers out on the mountain and having the opportunity to ride for such and enthusiastic crowd. I still love doing my trials demos because I get to meet riders from all around the world and introduce our sport to lots of new people. 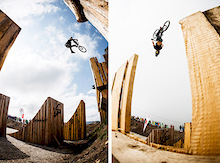 This picture was shot by Matt DeLorme at the Mountain Creek King of the Mountain Enduro this past September. This was the final stage and I knew if I had a solid run I had a good shot of finishing in first place. I'm not sure if I'm gasping for breath or letting out a sigh of relief because when I got to this point I knew the most difficult parts of the track were behind me. I ended up finishing first and I plan to do some more racing in the future. This photo was taken by Chris Vanderyact for a mini interview I did last year for Decline. 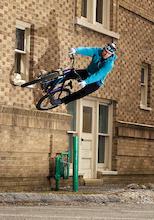 This was the first street riding shot I had published after breaking my tibia and fibula in February of 2010. On my first ride back I was cruising around Newton, NJ with Aaron Chase and George Ryan and I spotted this line. It took me a several months to get my "pop" back so I could jump high enough for this ledge ride, but when I knew I was getting the story this was the first line that came to mind. It ended up taking me a few tries but I'm stoked with how the picture came out.